Now it’s time for my final inspiration post. We started with where the first book began, at America’s house. So let’s close with where the first book ends: the palace. 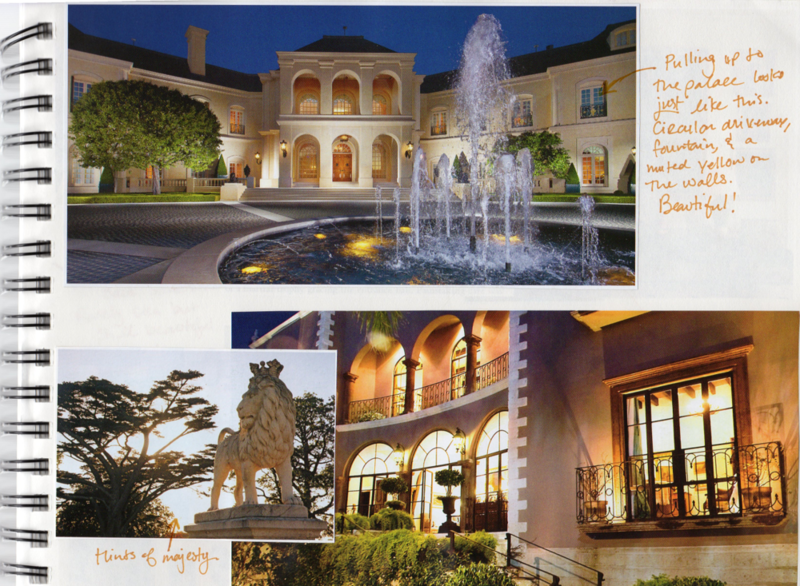 I also have several pages of notes dedicated to the palace, but the one I’m going with is what we see outside. I think the picture here is actually of the Spelling Manor. Visually, it’s the closest I can find to what the palace looks like to me. Now, I use the word palace (not castle) intentionally. Castles are typically more war-ready. Palaces are pretty. The staff in the palace have found ways to protect themselves, but they’re not very good at intimidating the rebels to the point that the reconsider their attacks. The outside of the palace is a lot like this, very bright and with a fountain in the front. But it’s four stories, not two. You would also find things around that look expensive (like statues, etc) on display to impress visitors, but there isn’t a pool in the palace because Gregory thought that was frivolous. Maxon talks about this being a beautiful cage, and I’m taken back to America’s first time walking up the front steps, with maids escorting her in so she could be prepped. The next time she saw them she was being paraded out to watch her best friend be beaten and humiliated before she was locked inside again. I think the question you should all be considering now is, will America see those steps again in The One? And what exactly would that mean if she does? Today is the day! It’s America’s birthday, and in celebration, I’m looking at my inspiration for her. Now, honestly, there are multiple pages dedicated to America in my inspiration book. Some solely focused on her hair or clothes. So when it came time to choose one, I decided to go the page that had the least. That probably seems unfair. If I’m supposed to be sharing… then why aren’t I sharing? Mostly because she didn’t. In the beginning, things with America were sparse. She’s a bit reserved, used to the background. Being in the spotlight, even if it was only in my head, was weird for her. I started writing The Selection between editing The Siren, and it sat for a few months before I knew I had to finish it. By the end of the first book, she was a little bit more assertive, a bit surer of herself. Not by much, but some. And it was about at that point (when she was okay speaking up) that I realized I’d have to rewrite the whole thing to get her right. And I’m really glad I took the time to do that. The picture we have up here is how I see America in the palace for the first time. Beautiful, but also kind of scary. Like you’re not sure if you want to talk to her or not (unless you’re Marlee and the sweetest thing on the planet and you don’t care). 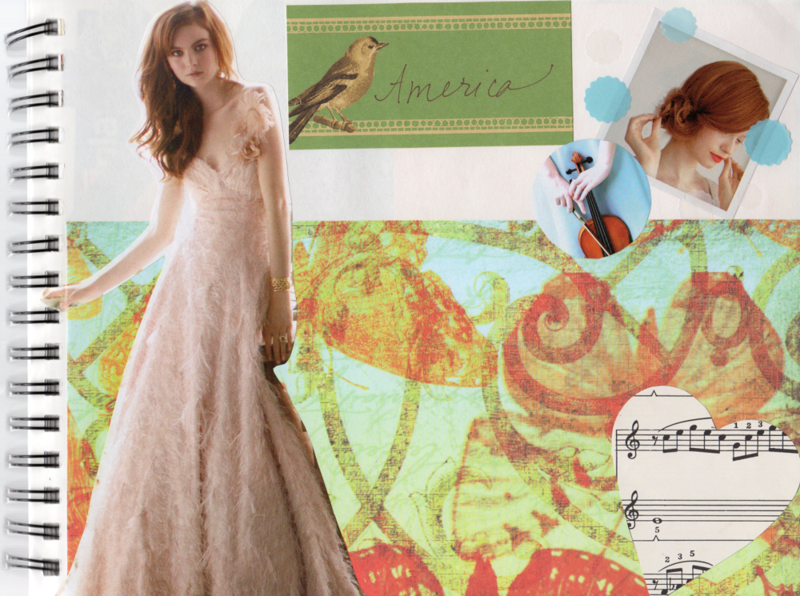 She’s surrounded by music, but also slightly distanced from it, and, of course, there’s a songbird nearby. And I have to say, the butterflies in the background happened before I knew what she’d be for Halloween. Funny how that works out. She’s lovely, but you’re not completely sure what she’s thinking… and you kind of want to know, right? I like this girl. So glad she popped into my head and not someone elses. I’ve known America longer than I’ve known my actual children. There’s so much to her, and there are parts that only I have. That said, I’m so happy that so many of you decided to walk through her story with her. I hope that the final book will have been worth the wait for you. Thanks. To America, happy birthday, love! Thanks for being a companion for so many years, for trusting me with your words, and, oh yeah, for paying off my school loans. Kisses! Today, we’re going to move from America’s home to the tree house. Namely, to the boy who waits there for her. Yes, today we’re looking at Aspen Leger. I know Efron is a strange choice, especially because when I see him, I sometimes think of Maxon. But it isn’t his facial features here that grab me so much as how dirty he looks. He seems gritty in his jeans and his boots. He looks like he’s been through something. There’s energy and exhaustion in him, fighting to control his reaction to things. I don’t know, something in all that screams ASPEN to me. Also, when I ran across that little line at the top, I knew that was his. I feel for Aspen. I think he and America both always wanted to be more open about loving each other, at least to their families. But America’s mother wouldn’t have it, and so it feels like they both kept the secret for her sake, not his. When they get to the palace, well, that’s a bit trickier. If you’ve read The Selection Stories, you know how much Aspen regrets his decision their last night in the tree house, and you’ve seen his history through his family tree that somewhat explains where his worries come from. I can kind of see that in the expression here, too. Thinking, looking ahead, trying to plan for every possible scenario. I get a lot of hate over Aspen, lots of people saying they wish he’d just die. I’m not going to try and convince you how special he is. But Aspen has a sacred place in my heart, and he always will. As the diehard Selectioners know, this Wednesday, February 26, is America’s birthday. Woot woot! To celebrate both her birthday and the final book in the trilogy coming out soon, I thought it might be fun to spend this week looking back. I want to take you to the start, to 2008, when I really started working on America’s story. I’d write bits and pieces, but when I needed to pause (or was forced to by a heroine who took her sweet time letting me get to know her), I’d work on the world surrounding her. Up in my office, I have a book. My inspiration book. And before Pinterest was a thing, this was how I held onto all the little scraps and images that helped me visualize Illéa and the people and places in it. Some of this, you’ve already seen. You have the complete list of the Selected girls, and you’ve seen my HIDEOUS drawing of what I dreamed the original cover should look like. But there are other things in there, and this week (which I’m calling Inspiration Week) I’ll be showing you a little of it. Now, there are lots of details I’m holding back because of have to, and plenty of the book is just girls in pretty dresses. So as far as actual things worth sharing… it’s limited. And there might not actually be much to say. But still, this is part of where it all came from. So let’s go back to day one, page one. Let’s go to America’s house. In the front left is Shalom and Magda’s room, the "big" one. Beside it is May’s room, which she used to share with America before Kenna moved out. In the back left is Kenna’s old room (now America’s), which you can see has a pretty clear view of the tree house. Next to her room is Gerad’s room, which he shared with Kota before he left. Note there is one bathroom for the five kids. That sucked. The sketched out TV is big, and I kind of imagined it looked that way in real life. Think pre-flat screen, that’s what the Singers have. 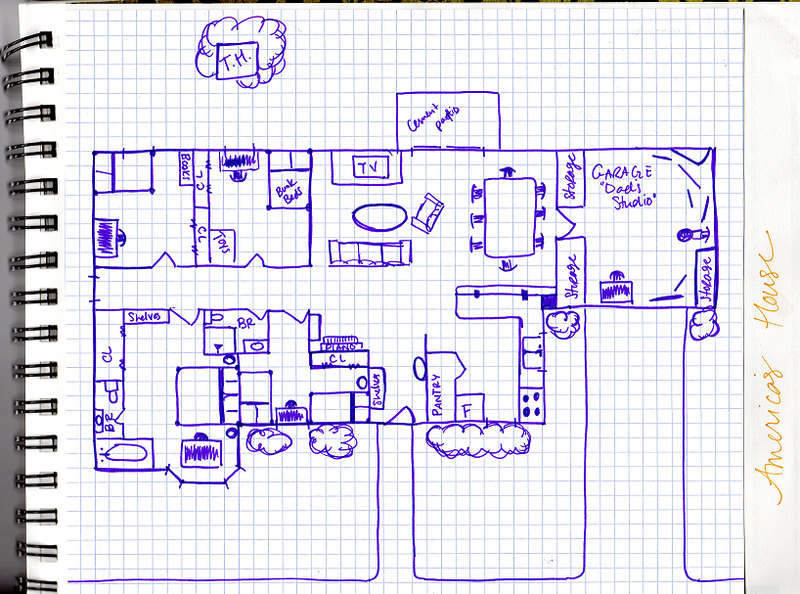 I also pictured the carpeting and general style to be sort of 70s-ish. But like, 70s if you grew up in the 80s. Carpet that used to be shaggy now worn down and basically hard in the places everyone travels, colors that are orangey and amber, warm wood tones. Not necessarily that whole style in the kids’ rooms, but in the living area for sure. There’s a driveway up to the garage, which is never opened because they don’t have a car, and that space is where America’s dad and May (and formerly Kota) do their work. It’s cold in the winter and hot in the summer. They really suffer for their art. It’s got an industrial feel in there, with shelves of supplies they buy in bulk because who knows when they’ll need what, and it’s cheaper that way. Occasionally, they hire a Six (cough cough) to make sure that everything is stocked up correctly and to get an idea of what they’ve burned through. Not all artists are good businessmen. I think about America’s front door a lot, especially lately. Since they’re artists, I keep wanting to put a color on it, but I’m pretty sure it’s black. Their front yard is small but clean, and they live on the edge of town where the houses end, just before it turns into a mass of apartment buildings. In the other direction, they have to walk a ways before the homes give way to an open space of shops and restaurants, plus the Province Services Office. The Singer family mostly keeps to their home. It’s old and outdated, but it’s cozy. And despite the occasional wave of tension, there’s a lot of love there. That’s it for today. Hope you enjoyed day one of Inspiration Week. More tomorrow!